It's a mystery that began back in the 1970s when the first images of Phobos were taken-what caused those streaks in the surface of one of Mars' largest moon? 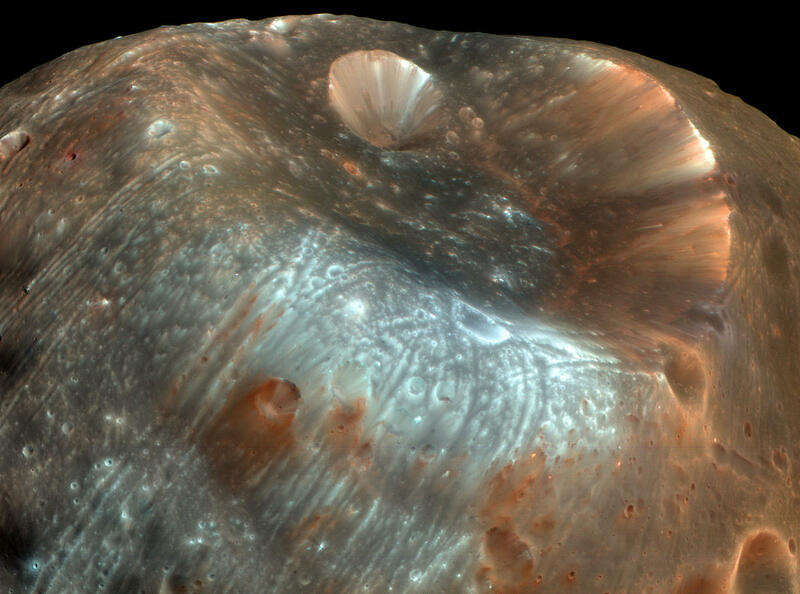 According to a new study, there may be a connection between the grooves and the event that caused the Stickney crater, one of Phobos' largest and most recognizable surface features. Kenneth Ramsley and James Head of Brown University used a computer simulation to observe how debris from the Stickney crater may have moved across the moon after impact. The crater is around 5.6 miles in diameter, which is especially large when you consider that Phobos at its widest point is only around 16.8 miles in diameter. That means that the crater was caused by a very large object, which would have resulted in very large "ejecta boulders" being thrown in various directions. Based on the simulations, it's plausible that when those boulders fell back to the surface of Phobos, they rolled around and created the grooves. "We think this makes a pretty strong case that it was this rolling boulder model accounts for most if not all the grooves on Phobos," said Ramsley in a statement. Some of the grooves cut across the crater and others intersect, which suggests that they were not all created at the same time and that some were carved after Stickney was created. The researchers say that it is also plausible that some of the boulders made it all the way around the moon and continued rolling, intersecting grooves that were carved in previous laps. There is a "dead spot" on Phobos that is completely groove-less, but the researchers have a theory about that too. Ramsley said that in the simulation, the lower elevation spots acted "like a ski jump" for the boulders. "The boulders keep going but suddenly there's no ground under them. They end up doing this suborbital flight over this zone." The results of the study sort of relate to our theory, which was that Rocket League is a historical game about a sport that used to take place a long time ago in space.